Programme regulator completely configurable by keyboard designed for all process types which require actions on contactors, servovalves with and without feedback and continuous outputs. Storage of up to 35 linkable programmes with five steps with initial waiting time. 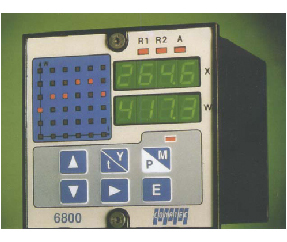 LED display for the control output action and alarm. 0-20 mA, 4-20 mA, 0-10v or 2-10 v.
- Single-loop relay direct or inverse. - Double loop relay direct or inverse. - Relay for servo-motor with and without feedback. Absolute, relative or band configurable alarm. Output 0/4-20 mA image of the input signal when not using analogic control. Input for operating with remote setpoint.